you will get a full-HD MP4 file with ca. 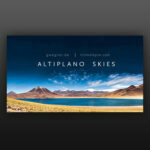 730MB – the best quality to watch Altiplano Skies on your TV or computer! GoPro HD Hero 2 with WiFi-BacPac, really looking forward to shoot my new GoPro HD Hero 3 Black soon! Thank you very much to all artists for sharing your awesome music under the CC-BY license, making this great soundtrack possible!